Annie came to town Wednesday and brought along her parents. How great to see them all again and to see how much Annie has grown!. What a sweet little girl. She talks a lot for her age and is such a good eater. She loves veggies and fruits and almost everything. Don't think I've ever seen a little one who will eat that way. She and her grandma and grandpa are having such a good time together. 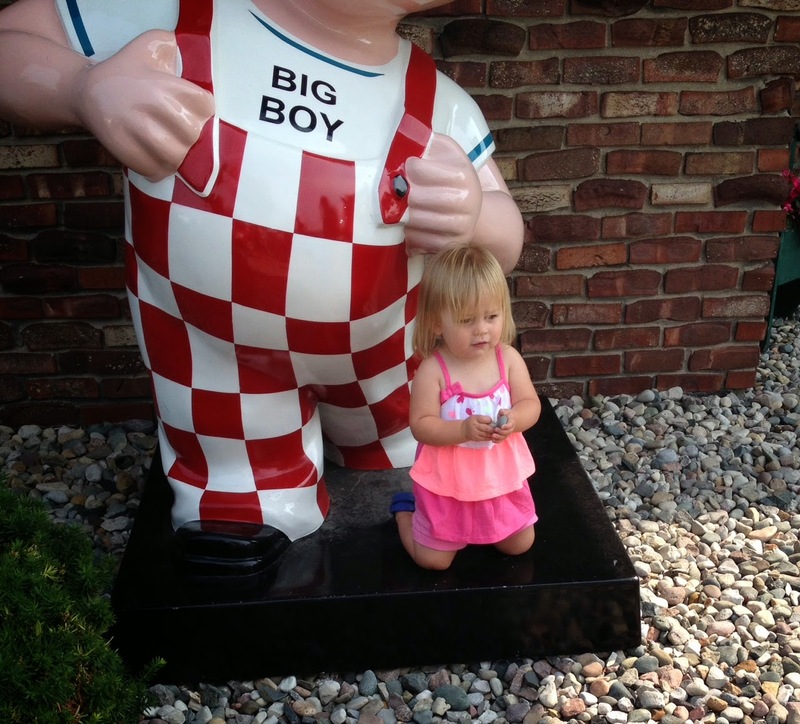 They all went back up to the cabin yesterday right after we had some breakfast at Big Boy - thus the picture. She was fascinated with the rocks as she has been doing a lot of throwing rocks into the lake at the cabin. While at Sherry's the other day, she got out some of the girls' and her old dresses-some she had made and some I had made. What fun to see dresses I had sewn for Sherry when she was small. I didn't realize how many of them she had. There was also a darling dress that she had smocked for one of her girls. She has always been a good seamstress but has not had the time for it for years. 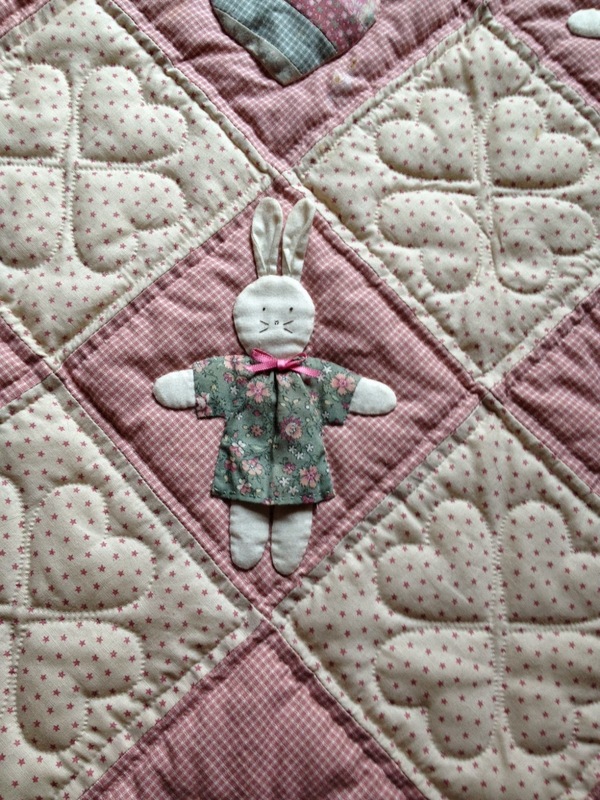 Then there was this little wallhanging that I made for Hannah in 1989. I had forgotten what it looked like. Back then, we didn't quilt as closely as we do now and quilts were much puffier. 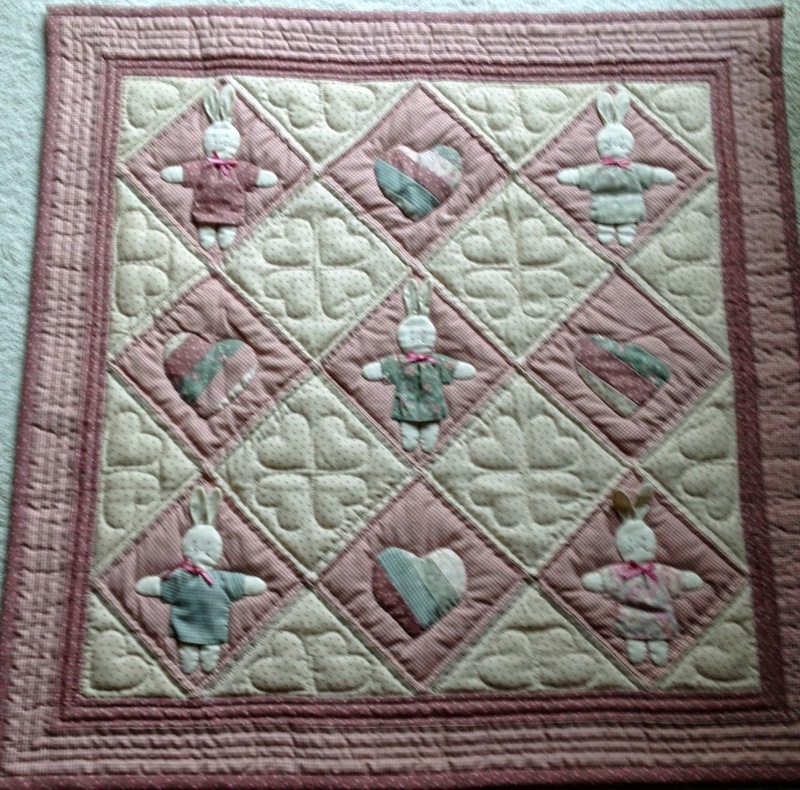 This one is hand quilted and hand appliqued. I brought it home but, of course, it will go back after I have taken it to show and tell. Such a difference in the fabrics and styles from the present. Tuesday when I went out to lunch with some of the girls, Linda brought me the quilt she has quilted for me. 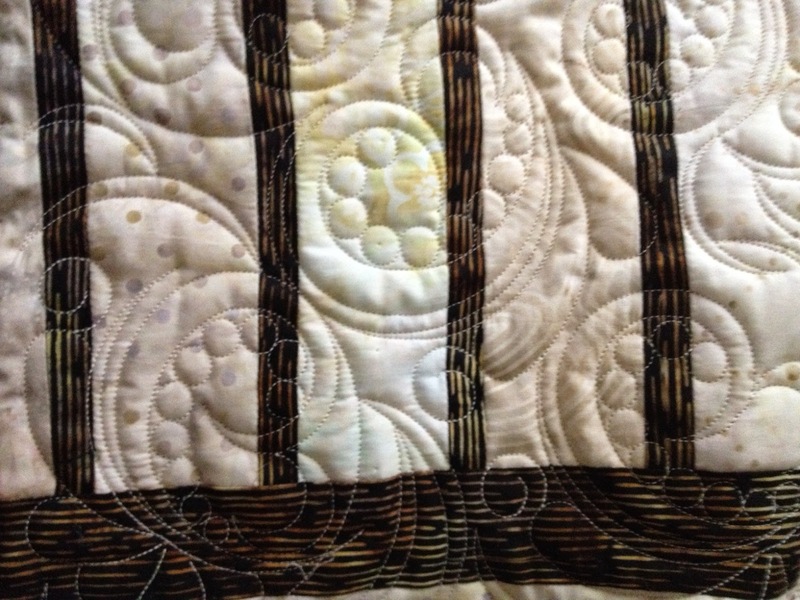 As usual, the quilting is beautiful and I am so happy with it. This one is for my daughter and I will get it trimmed and bound soon. 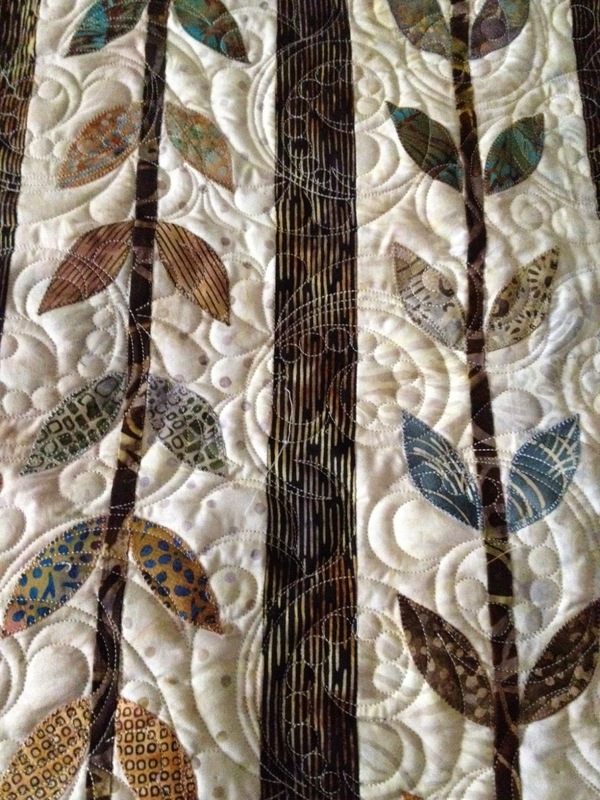 Here is the border - gorgeous quilting. And the strips of leaves. I really love the colors in this quilt - they are all batiks. The binding will be the dark brown stripe. Haven't we had just gorgeous weather? 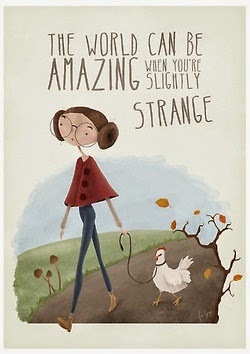 I love, love, love it! Hope your weekend is a great one. 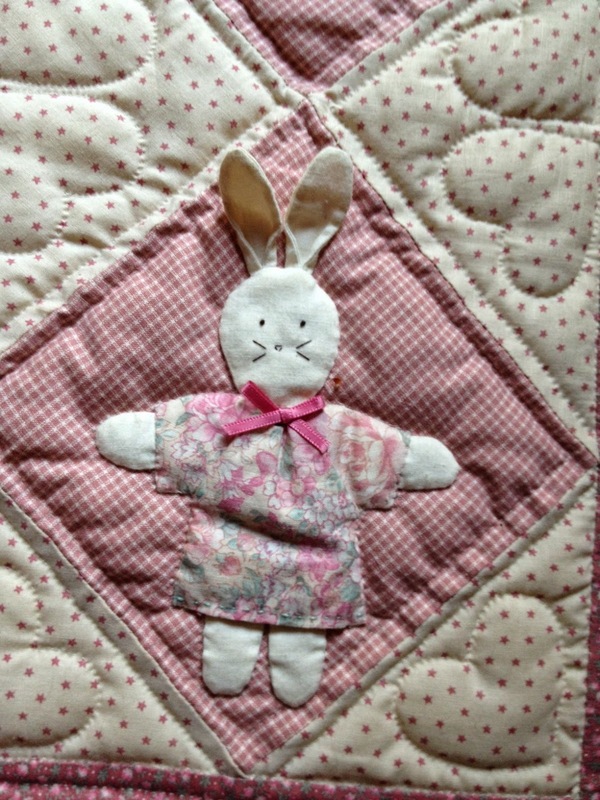 The bunny rabbit quilt is so adorable! New or old your quilts are always so wonderful. 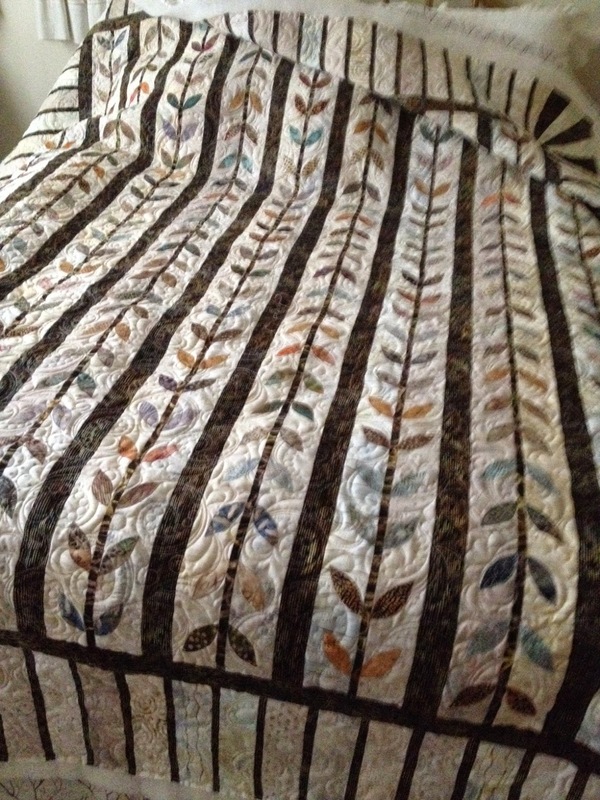 I love your leaf quilt. I hope we get to see it before it goes to its permanent home. Does the outer striped border curve at the corners - it just barely shows in the photo?